My roommate has signed up for some wine of the month club. So far they’ve been mostly reds which I can’t drink but this month two bottles of white came. 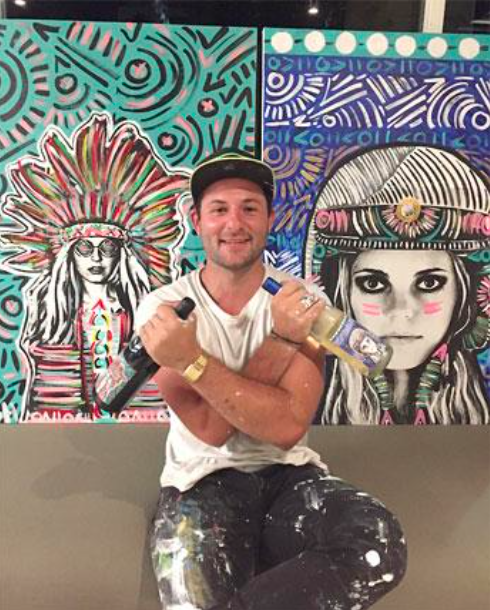 Unfortunately, one of the bottles has a drawing of a white woman with Native American* face paint and headdress. So my comment to my roommate was “I don’t love the cultural appropriation” which earned me an eye roll and a bit of a tone from her for the rest of the conversation. She didn’t understand my complaint. She asked why I couldn’t just see it as “honoring” Indigenous culture. She also compared it with a woman attending an Indian (as in from India, not to be confused with American Indian) wedding and wearing a sari. This conversation lead me to believe that, despite the numerous articles about cultural appropriation every Halloween, people are still confused about the concept. My generation grew up in a society that used symbols and styles from non-dominant cultures regularly and without discussion—Chief Wahoo, Bindis for teeny boppers, Day of the Dead make-up (which I did for Halloween just a few years ago and now feel horrible about), Rasta tam with dreadlocks, the list goes on and on. Because there was no discussion, many of us from the dominant culture have grown up not recognizing how our use of these symbols and traditions can be deeply offensive. We also didn’t get proper history lessons on colonialism so it’s hard to put the pieces together ourselves. Now that we’re grown it’s our responsibility to educate ourselves. Olufunmilayo Arewa argues that “borrowing” becomes appropriation when it “deprives [the minority people] of opportunities to control or benefit from their cultural material.” That is clearly the case for this wine company. A white-owned winery is using Native American style and design to market their product without any Indigenous tribe receiving compensation. This isn’t “honoring” the tribe. It isn’t even specific to a tribe but uses stereotypical shapes and symbols as decoration without consideration of the cultural significance of face paint and headdresses. Headdresses in Native American cultural are reserved for a leader who has earned the respect of the tribe—it is not a fashion statement for just anyone to wear. It would be like a Jewish American walking around Rome with a clerical collar. “No, I’m not a priest or even Catholic but I like the way this collar looks.” Disrespectful. Because we aren’t familiar with these cultures we trivialize and fetishize their traditions. There is nothing honorable in that. So why isn’t wearing a Sari to a traditional Indian wedding cultural appropriation? For one, no one is profiting off it. No one is having a laugh, fetishizing, or pretending to have invented Saris. When a non-Indian woman wears a Sari to a Indian event it is out of respect for the traditions of that event. It is usually at the request of the Indian family hosting the event. Exploring, temporarily adopting, or enjoying other cultures isn’t automatically appropriation. One must consider their own intention as well as how their behavior will be perceived by the non-dominant culture. The intentions of the member of the dominant culture are secondary to the perception and feelings of members of the non-dominant culture. For example, when I was 17 years old I went to prom. I asked a friend to do my hair for me. My friend was Black (I am white) and given free rein to style me as she chose since I had no idea how to get fancied up. She chose to give me cornrows that went back into a French twist. Cultural appropriation was not a phrase with which I was familiar at 17 year old so it didn’t occur to me that this might not be a great idea. I just let my friend do my hair. I had no intention of mocking, stealing, fetishizing, or profiting from my cornrows. However, I may have been offending countless people by being white girl wearing cornrows. To enjoy the styles of a non-dominant culture while never having to experience their struggles because of my privileged place in the dominant culture is not something with which we should ever get comfortable. *For the purposes of this article I will use the phrases Native American and Indigenous interchangeably but I recommend this article to consider how Native and Indigenous people North American think about these labels.